Terma has entered into a contract with the Center of Emergency Communication (CFB) for the delivery of a radio dispatch system including service and maintenance to the Danish National Police. The new radio dispatch system replaces the version that Terma delivered to the Danish National Police in 2013, which has performed at a constant high and stable level since delivery. The new radio dispatch will provide 24-hour service to approx. 100 simultaneous users at 15 of the National Police’ control and operations centers. In addition to the delivery, the contract includes service and maintenance, and it ensures a continuous possibility of system development through option packages that can be purchased during the contract period. "The contract is of great importance to Terma, and we are pleased to continue the collaboration with the Danish National Police in the coming years. Together with the Danish Defense, Copenhagen Airport, the Danish Regions, and the Danish Emergency Management Agency, the Danish National Police is a significant and valued Danish customer of Terma. Through our collaboration with these customers, we support the Danish authorities' efforts to secure safety and security in Denmark,” says Lars Hedemann Hilligsøe, Senior Vice President. CFB's task is to ensure that the state investment in emergency communication is managed and further developed to the best possible extent. 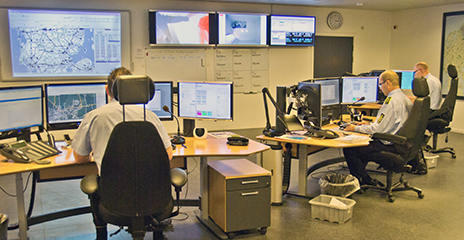 CFB is responsible for developing efficient, well-functioning, and technologically updated communication systems for the Interior Danish Emergency Management. A radio dispatch manages the communication between control centers and operational units (handheld terminals, car terminals, and mobile command centers). With Terma's radio dispatch, the staff at the emergency centers obtains an efficient overview and will be able to manage and coordinate emergency responses in crisis situations and in everyday life. The radio dispatch can be scaled from one control room to any number of control rooms distributed on a given geographical area and can be configured to handle the necessary subset of voice groups and terminals in the nationwide Tetra network SINE.